2 1/2 to 3 cups chopped vegetables - 1/2-inch pieces (I have used zucchini, yellow squash, red & green bell peppers, cauliflower, Brussels sprouts, broccoli and carrots) ...broccoli in florets, carrots in 1/4-inch slices. In a large pan over medium-high heat, saute onion, garlic and chicken for 3 minutes. Stir in rice, chicken stock, salt & pepper. Bring to boil, reduce heat, cover and cook for 15 minutes. While rice cooks, prep vegetables. After 15 minutes, stir in vegetables, cover and cook 5 more minutes. Remove from heat and let stand, undisturbed for 10 minutes. 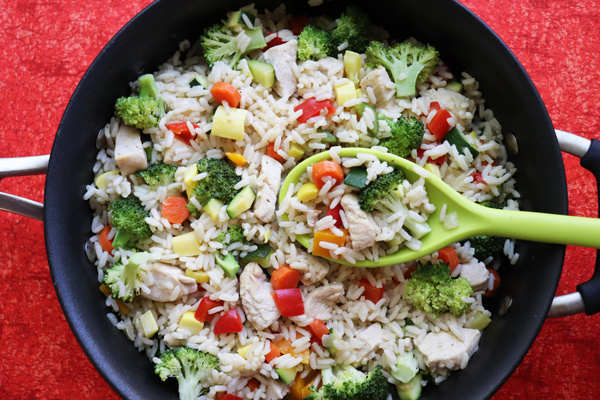 23 Comments on "Chicken Veggie Rice"
Looks very good. Thank you for the recipe Jenny. I just finished eating this recipe and it is healthy and delicious! Thankyou for this great recipe! I am going to try to make this whole recipe in my rice cooker. Hope it turns out nice. Seems like a delicious recipe and simple one. Thank you for your culinary creations. Well, I just made my version of this recipe using the ingredients I had on hand. For the rice, I only had basmati on hand, so that’s what I used. For the vegetables I had frozen whats called “california style”, which is cauliflower florets, broccoli cuts, crinkle cut carrots and diced red peppers, and for the garlic, I didn’t have any fresh, so I used almost a teaspoon of crushed garlic in oil. Almost the same as Jenny’s recipe, but not quite and it turned out fantastic. Just a great recipe Jenny. Thank you! Hi Jenny, I can’t wait to make this, which I will this weekend. Thanks so much for sharing your recipes. I know I will always find something delicious to make when I check out your recipes. I can’t tell you how your dishes saved my days many times. I get such good ideas what to make from you. Sometimes I just don’t know what to cook, so I check out your recipes & I find a great recipe. Thanks. Love this recipe. Lots of veggies. I will make it in my Instant Pot. Thanks for all of your recipes especially the Polish ones. 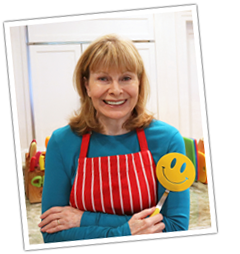 HI JENNY, YOU MAKE YOUR RECIPES SO EASY EVEN FOR SOMEONE WHO CANT REALLY COOK OR BKE WELL ! Thank you, Jenny. I make a lot of your recipes for Christmas but love them all. I especially like the potato pancake recipe, reminds me of my mom making them for us, yours and her recipes are pretty similar. They are so good. Have a beautiful Christmas, and stay healthy and happy in the New Year. God bless you! Merry Christmas and all the best in 2019 from London Ontario. I just love all your recipes. I look forward to more! Hugs! Jenny this looks good for these COLD Days here in Delaware. Jenny your recipes are terrific….. Thank you for this addition to your other great recipes Jenny. Will certainly be giving it a try soon. wishing you well ,and hope you have a Wonderful Christmas ,thank goodness for the computer ,we all can keep in touch like friends, that have no faces lol , we all miss you so much on the utube,, but glad you keep in touch with us , just wondering did you hear ,of have, the Instant Pot ? gosh its so easy to get meals done in no time, I have one and now am addicted to it, this recipe that you sent with the veg and rice, is wonderful in the instant pot one just dumps goes on with the work around the house and whalla its done , if you do ?can you share some recipes with us ? hugs . Admire you greatly for years but do so more so now. Thanks Jenny for sharing yet another of your Gifts…Cooking & Baking adding warmth to our Lives. I made your snowball cookies and they was great. I just want to say I just love you so much I mean your cooking and baking do you have and crock pot or pressure cooking recipes?